SANDWICHES CAN BE the most boring of meals or something more epic – if you put a little effort into it. It’s all too easy to slap some ham and cheese between a couple slices of bread, but sandwiches can be so much more and they deserve your effort. You’ll appreciate that (slightly) extra work when you’re chomping down on a sandwich so delicious you want to marry it. And then you can thank us. Let’s start as we mean to go on, shall we? With ridiculously over-sized sandwiches packed to the gills with fillings. This particular version has three types of meat (turkey, beef and soppressata – a type of salami) and two types of cheese (cheddar and provolone), so it’s one to make only if you’re really hungry. It’s basically a really fancy club sandwich – try it. We dare you. 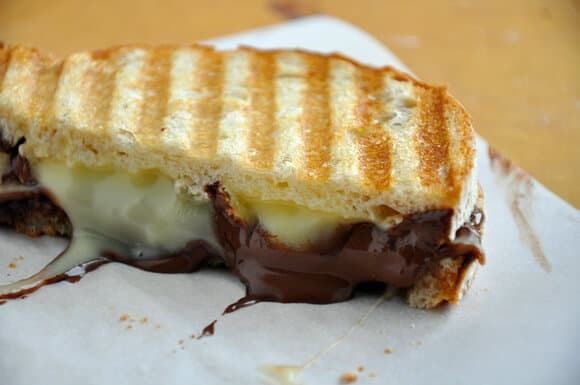 A grilled cheese sandwich is just a toasted cheese sandwich to us non-Americans, although they tend to be fried rather than put in a sandwich maker but – potatoes, potahtoes. Speaking of potatoes, this sandwich contains them. It’s a shepherd’s pie grilled cheese sandwich and… words fail us. But what is life for if not to experiment, and you probably can’t get much more experimental than putting leftover shepherd’s pie between two grilled cheese sandwiches. What’s that you say? Mac and cheese is already a delicious meal, and there’s no way it could be made any better? That’s because you haven’t put it between two slices of bread – which makes everything better. This sandwich adds pancetta and, you’ve guessed it, grills it to complete the melty cheesy goodness. Chicken satay is usually chicken on a skewer dipped into a spicy peanut sauce and eaten with glee. This sandwich takes all the best elements (chicken, spicy peanut sauce) and adds in melted cheese and avocado to bring this classic dish to a whole new level of deliciousness. You can probably mess around somewhat with the fillings to make it to your taste – more or less spice, for instance, or leaving out the avocado or cheese altogether, but you should definitely try it. Not strictly a ‘sandwich’ although it could fall under ‘open-faced’ sandwiches if you want to get technical, this is a great brunch idea. It’s really easy to make and has the additional bonus of being both healthy and tasty. Hipsters may ruined avocado toast for you, but you can reclaim it. For brunch. We know, it sounds mental. But think about it – sometimes the craziest combinations work best together. Chocolate and popcorn, anyone? So, open your minds, and go some good brie and dark chocolate. What works about this combo is what works about chocolate and seasalt, salted caramel and popcorn and chocolate – the combination of sweet and salty. This could be your new go-to comfort food. Let us know. Have you any amazing sandwich recipes? Will you try any of these? Let us know in the comments below. Email “Ditch the ham and cheese: here are 6 super sandwiches to try”. Feedback on “Ditch the ham and cheese: here are 6 super sandwiches to try”.